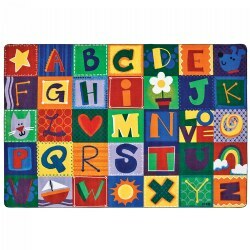 Literacy focused carpets will reinforce the alphabet for young children. 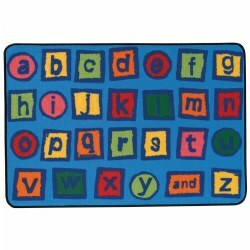 These comfortable and brilliantly colored rugs use various themes to strengthen a student's awareness to each letter. Carpets come in a number of sizes and shapes. 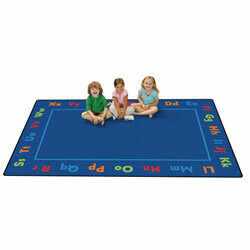 The Fun with Phonics Seating Carpet teaches the alphabet and provides children with plenty of wiggle room. 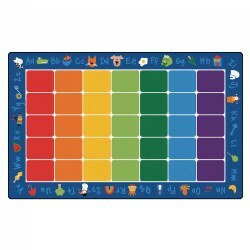 Carpet features phonic images, making it a fun place for children of all ages to learn. Available in oval, semi-circle or rectangular shapes. 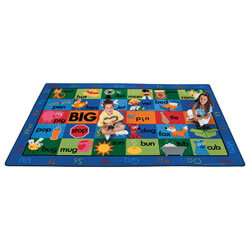 Add the Fun with Phonics Squares to create more leaning fun (sold separately). Every day is sunny with these colorful carpets. Alphabet squares help teach letter and color recognition while clouds encourage numeracy skills. Choose from oval or rectangle shapes in various sizes. 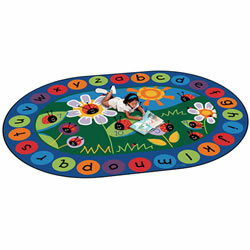 This colorful literacy rug teaches children how to recognize upper and lowercase letters of the alphabet. The KIDS Value Plus line sports upgraded KIDply® backing and edge yarn for long-lasting carpets that stay looking great. Available in two sizes (6' x 9' and 8' x 12'). Made in the USA. Features: 5 Year Abrasive Wear Warranty, KIDply® Backing, 100% North American Made, No-Fault Edge Warranty, Soil Resistant, and Passes CPSC FF1-70, Standard for the Surface Flammability of Carpets and Rugs. 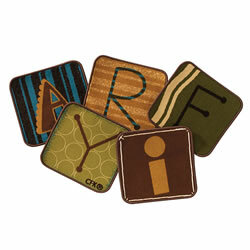 From A to Z, these adorable area rugs will be a welcome addition to any room. Their vividly colored animals provide the perfect seating place for children to learn their alphabet. Proudly made in the U.S.A., these area rugs are wonderfully designed to seat up to 30 children and durable enough to provide a life time of memories. 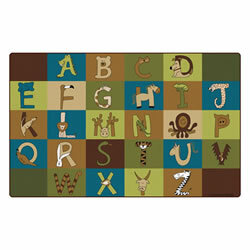 Add A to Z Animal Squares (sold separately) for additional learning and fun! Ten adorable ladybugs will encourage kids as they learn to count and gain number recognition. 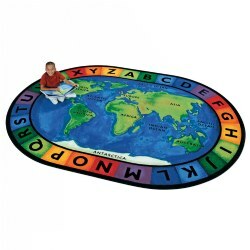 In addition, the bright literacy border creates a great place for Circletime or anytime. It's never too early to start learning your A to Z's. 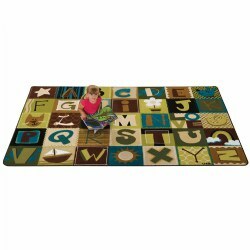 This children's educational play carpet provides a perfect, cozy space for playing, toddling, and learning. 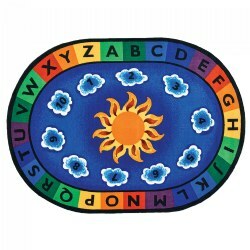 This wonderful rug, featuring 18 bilingual inner squares surrounded by an alphabet border, provides the perfect Circletime rug for any classroom or children's setting. 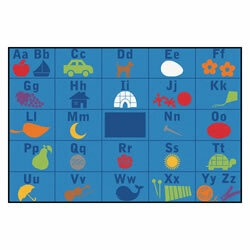 The inner squares feature 6 simple icons, 6 colors and 6 shapes displaying their English and Spanish names. 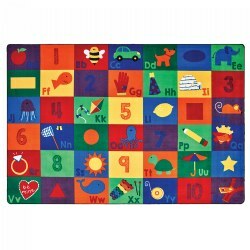 This colorful rug teaches children the alphabet and numbers. Great to use for seating and circletime. The KIDS Value Plus line sports upgraded KIDply® backing and edge yarn for long-lasting carpets that stay looking great. Available in two sizes (6' x 9' and 8' x 12'). Made in the USA. Features: 5 Year Abrasive Wear Warranty, KIDply® Backing, 100% North American Made, No-Fault Edge Warranty, Soil Resistant, and Passes CPSC FF1-70, Standard for the Surface Flammability of Carpets and Rugs. 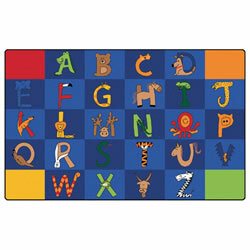 A to Z Animal Squares can be used alone or combined with the A to Z Animals rug (sold separately) for matching fun. 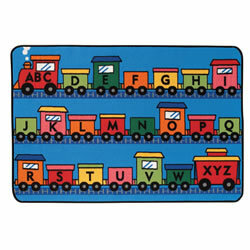 The vividly colored animals provide the perfect way for children to learn their alphabet. Proudly made in the U.S.A., these squares are durably designed to provide a life time of memories. Set includes twenty six squares. Kit includes twenty-six squares for each letter in the alphabet. Featuring calming nature colors. Great for learning. Larger squares measure 14" x 14". The sequential alphabet features upper and lower case letters with a matching icon in each square. 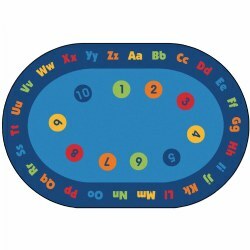 Numbers and shapes make this a great multipurpose rug that can be used for a variety of lessons and a great tool to encourage learning. Available in four sizes. 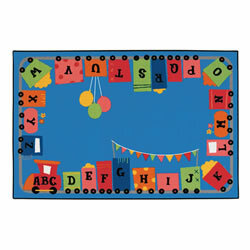 This colorful literacy rug teaches children the alphabet and is great for smaller areas in the classroom. 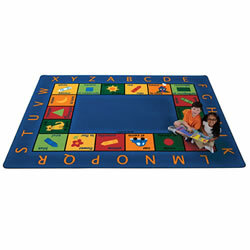 These colorful seating carpets will provide hours of rhyming fun! Warm tones and whimsical designs set the stage for play and learning. Lifetime pile wear warranty. Meets NFPA101, Class I Fire Code. Made in the USA. With a unique hand-painted look, this beautiful world rug will enhance any room?s decor. The inner motif features the oceans and continents while the outer border colorfully shows off the alphabet. 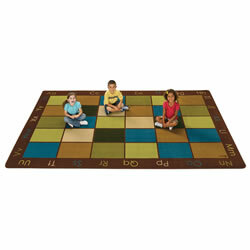 Each alphabet square provides a perfect place for children to sit during circletime or anytime. 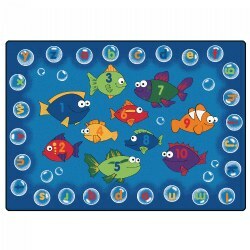 You'll get hooked on Literacy & Counting with these brilliantly colored, fishy friends. 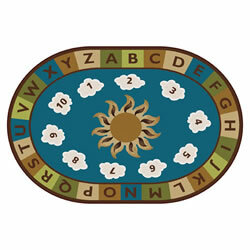 The alphabet bubbles on the outer edge of these rugs provide a perfect Circletime setting. These area rugs are proudly made in the U.S.A. and durably designed to provide years of enjoyment. This adorable area rug is perfect for any room. 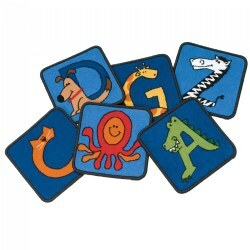 Animals from Alligator to Zebra, provide the perfect place for children to sit and learn their alphabet. Measures 7'6" x 12'. 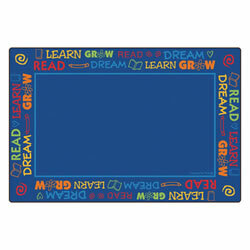 Bordered by the words: Learn, Read, Dream, Grow, this rug provides a great place for gathering and reading in any childhood setting. Hippity hop to the top where you will meet a cute little frog! Children learn their numbers 1-10 and the Alphabet while developing gross motor skills. 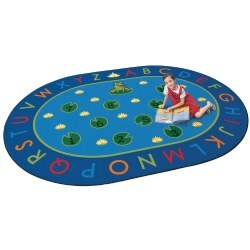 Circle time or anytime, this area rug promotes fun while learning. Available in round and oval sizes.